The National Thoroughbred Racing Association (NTRA) announced today that registration is now open for the Sovereign Stable Free NHC Online Contest to be held Saturday, Aug. 17, at games.ntra.com. 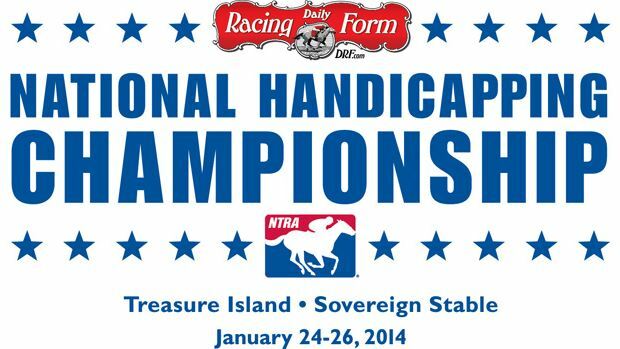 The top two finishers in the online tournament will receive berths in the $1.5 million-guaranteed Daily Racing Form/NTRA National Handicapping Championship, Presented by Racetrack Television Network, Sovereign Stable and Treasure Island, Las Vegas (NHC), January 24-26, 2014. The two qualifiers also will each receive a $250 air travel voucher and hotel accommodations for their trip to the 2014 NHC. Saturday’s free contest, sponsored by Sovereign Stable, is open to all members of NTRA Inside Track, offering free access to NTRA communications and benefits. To register for Inside Track, visit ntra.com/en/signup. The Sovereign Stable Free Online Contest requires contestants to place mythical $2 win and place wagers on 10 designated contest races on Aug. 17. The 10 contest races will be posted online by tournament officials on Thursday, Aug. 15. Selections may be made beginning Friday, Aug. 16, after official program numbers have been assigned. Free DRF past performances for the tournament races will be available at the contest site. All selections must be made no later than one minute prior to the scheduled post time of each mandatory race. The two players amassing the highest number of points based on the players’ earnings (i.e. the highest final bankroll) from all mythical $2 win and place wagers at the end of the competition will receive berths in the January 2014 NHC in Las Vegas, provided that they have a paid membership for the 2013 NHC Tour prior to the start of the tournament. 1st Place: 2014 NHC seat, four-night complimentary hotel accommodations at Treasure Island, a $250 flight voucher and a $1,500 credit toward the purchase of an interest in a Sovereign Stable racehorse. 2nd Place: 2014 NHC seat, four-night complimentary hotel accommodations at Treasure Island and a $250 flight voucher. 3rd Place: $1,500 credit towards the purchase of an interest in a Sovereign Stable racehorse. 4th Place: $250 Sovereign Stable merchandise credit. · During the 2013 calendar year, a $3,000 bonus will be paid to anyone who finishes first in two NHC qualifying tournaments (live or online). An additional $4,000 bonus will be paid to any individual who finishes first in a third NHC qualifying tournament. An additional $5,000 bonus will be paid to any individual who finishes first in a fourth NHC qualifying tournament. · Weekly e-newsletter featuring player profiles, recaps of previously held tourneys, schedules and links to upcoming tournaments, etc. For more information about the Daily Racing Form/NTRA National Handicapping Championship, visit www.ntra.com. For further information or questions about the Saturday, Aug. 17 tournament, contact Michele Ravencraft of the NTRA at (859) 422-2657 or via e-mail at mravencraft@ntra.com. Sovereign Stable has been a leader in Thoroughbred horse racing partnerships since 2001. Born from the Gatsas Family Stable, which campaigned such standouts as Gander and Shadow Caster, Sovereign has forged a solid reputation for high standards, professional management and success on the track. Sovereign’s top runners include Alcibiades winner Negligee, as well as Remand, Codeword, Awesome I Am, Funny Honey and Sports Town. The NTRA is a broad-based coalition of horse racing interests consisting of leading Thoroughbred racetracks, owners breeders, trainers, horseplayers and affiliated horse racing associations, charged with increasing the popularity of horse racing and improving economic conditions for industry participants. The NTRA has offices in Lexington, Ky., and New York City. NTRA press releases appear on the NTRA website.